The ancient Egyptions worshipped more than 2000 gods + goddesses! Most of the gods and goddesses had animal parts represting their strength or the thing they were god or goddesses of. Sobek, for instance, Sobek was a Nile god. Sobek was connected with the Nile, and protected the king. Live crocodiles were kept in pools at temples built to honour Sobek. Sobek had the head of a crocdile but the body of a human. 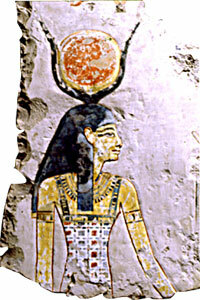 Hathor is a royal goddess. Her name means 'House of Horus". This site was last updated Nov. 13. This site contains information from other sites. This site is not yet finished.